In partnership with Springhill Day Camp at Oakwood Church. This week-long day camp for preschool children brings Bible stories alive. This year's theme is "Tell Me a Story." We'll discover the power of a great story and how each of us has a part, at this fun-filled week of Bible teaching, puppets, games, crafts, and singing! 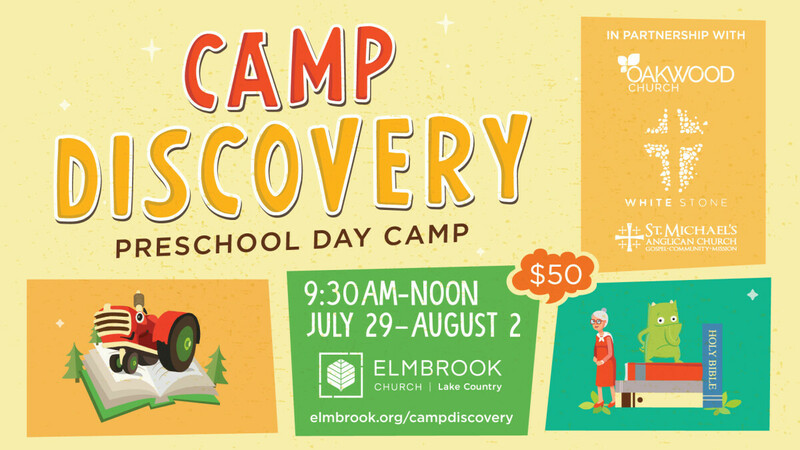 Elmbrook is partnering with Oakwood Church, White Stone Community Church, and St Michael's Anglican Church to offer this preschool camp the same week as the Spring Hill Elementary camp at Oakwood Church. Held 9:30am-noon, Monday through Friday, July 29-August 2 at the Lake Country campus. For children age 3 (as of January 2019) through entering kindergarten. Must be potty trained, please. Cost: $50 per child. For Elementary age kids check out our partnership with SpringHill Camp at Oakwood Church HERE. It is the same week and just 1 mile up the road from Camp Discovery! Volunteers are needed. Be a part of making this great week happen, and have fun along with the kids! For questions, or to volunteer, contact Jan at .